ABOVE: The San Clemente Palace's swimming pool offers a refuge from summer heat. INSET: Whirlpool baths in the mosaic-tiled spa. 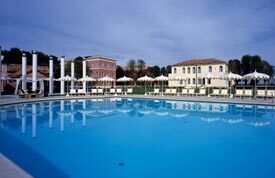 Swimming pools, spas, and other recreational amenities aren't common in Venetian hotels, except for the larger hotels on the Lido and the ultra-expensive Hotel Cipriani on the island of Giudecca. This isn't a major hardship for the average tourist, who spends only two to three days in Venice, but resort amenities are certainly a plus for those who stay longer--and on a hot summer day, there's a lot to be said for jumping into a pool or soaking in a whirlpool after trudging the pavements of the historic center. The San Clemente Palace comes to the rescue with a large outdoor pool, two tennis courts, and a three-hole "executive golf course" where you can pitch and putt between aperitifs. There's also a Beauty and Wellness Club with a steam room, sauna, exercise room, and spa treatments that range from massage to aromatherapy.